Weekly Wrap-up: fall in love with Fall! It’s time to wrap up another week gone by, seven more days crossed off our calendars bringing us closer and closer to the end of the year. Can you believe that? The temperatures are cooling wonderfully, the cross breeze I’m experiencing sitting here at the computer in my apartment is actually making me cold… and I LOVE it! Fall is my favorite time of year. I just told my husband this morning that I’m pretty sure October through January are my most loved months. Not only for the cool and cold weather but for the colors, the holidays, the everything. Now that Fall is seriously upon us (or very nearly so) I was positively thrilled to see so many beautiful kits in the store, new and old, that embody that rich warm and cool bold pallets of Autumn. These are just a few of the many amazing kits we have in store for the impending season. I really recommend looking through them, you never know what gem you’ll find that you didn’t know was there! Today, in Wisconsin (that’s where I’m at- *waves! *), is our pride and joy, the Green Bay Packers, season opener. The state goes into a FRENZY during football season and whether you like football or not the love for our team is so contagious that you just can’t help but root for them. With that said I know I won’t be the only one hosting a game party throughout the season- no matter who you’re rooting for, and with our August Buffet: Go Team! you’ve got plenty to scrap those game day photos, something I’m entirely TOO excited about! There are a few days left to get your emails in for our Ad Team Call! I’d love to increase our fun little team to include some bright new faces! Kawouette Designs is still looking for a few people to add to her Creative Team! Make sure to check out her call as well. One last thing, before I go, because I don’t want to forget! Book Club is back for the month of October, and the poll to pick our read is up! So do head on over and vote for next months book! I think that’s about all I’ve got for you today, I’m sure I’m missing something or maybe a few somethings- but if you head over to the forum you can see all that’s going on! Hope you all have a super happy scrappy Sunday! Weekly Wrap-up: New month! & 3000! Are you wondering what the 3000 bit is? I’m pretty excited to share with you we’ve reached 3000+ “Likes” on our Facebook page! All weekend long I’ve been having fun giving away designer coupons and gift certificates to our wonderful fans. It’s been fantastic! To find out more, and to have your chance at a little treat, make sure to go “like” us on Facebook. New month means new buffet, Sarah introduced us to this beautiful new buffet yesterday. Our designers blended so perfectly this lovely color pallet. Life IS beautiful! NEW GUEST DESIGNER! I suppose I didn’t need to CAPS it, but how exciting, right?! Ocean Wide Designs is here to play with us during the month of September. I’m excited and can’t wait to see what she’s got in store for us – literally and figuratively. HA! There’s quite a bit to share today, let’s just keep going friends! There are two, very different, but equally fun calls going on right now. First up, our newest designer Kawouette, is having a CT Call! I really love what she’s shown us so far and am excited to see what else she will create for us! The other call happening, is one very near and dear to me of course, my own call! “But you’re not a designer!” Of course not, silly. 😉 The Ad Team is looking for a few good peoples. I will leave you with that for today. I’ve got to head over and surprise a few Facebook fans with some Sunday morning fun! 😉 Have a happy scrappy day my friends! Weekly Wrap-up: S is for (Back to) School Scrapping! I am currently stuffing my face with some sort of berry muffin. It is absolutely delicious, just in case you were wondering. I haven’t got much for you today, but let’s have fun anyway! Blue Heart Scraps is having a CT call! CT stands for Creative Team, something I learned after joining the GingerScraps community earlier this year. Joining a creative team is super fun, not only do you get to work with great products from our GingerScraps designers but you get to be on a team with some pretty outstanding ladies! Even if you’ve just started scrapping, I always say apply! You never know if a designer sees that something special in you. So, kids are back in school right? Well, not for me, not for another few years yet but with all those “first days” I can only imagine the few hundred photos now on your SD cards. 😉 We’ve got several great “Back to School” kits in our shop! Some new, some old but all of them are perfect for this time of year. Personally, while I’m enjoying the toddler years (you’ll never hear me say that again) I can’t wait for back to school shopping and filling my camera with First Day photos! I should start stockpiling school scrap kits NOW so I’m prepared! 😉 Let’s not forget our August Grab Bag this month! It’s FREE with the purchase of $10 in the GingerScraps store. Guess what? It’s another fantastic school themed kit! Have a happy scrappy day and enjoy the little things! Weekly Wrap-up: A little bit sugary! I feel like the weekend is never long enough, it’s always come and gone in a blink of an eye! I’ve got a little treat for you today! I caught up with Ana of Sugary Fancy and got her to share some fun tidbits about herself. 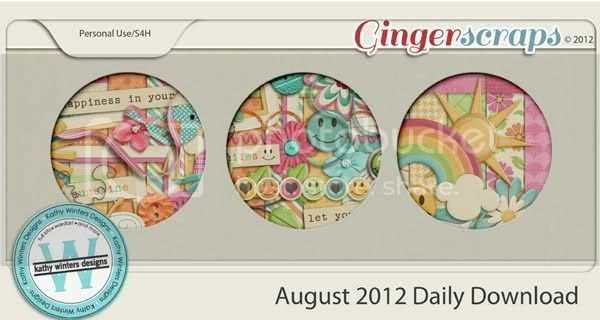 Ana is our Guest Designer for the month of August, and I just love her doodles and her sense of FUN! I asked Ana to take a silly photo of herself – SMOOCHES! What are three things you MUST have for designing? What is your favorite part about designing? I love everything about designing… I think I love doodling! hehehe! But yes, I love everything, doing papers is fun, coloring doodles, putting everything on the preview and choosing the best way for it to be. What was your inspiration for “Little Miss Jolly” ? First I saw an image with the colors, orange, yellow, pink, brown and I thought that this colors combo would be a good choice for a girlie kit, then I started thinking in about what to draw and add to it! Do you have a design process? For example, do you plan something out ahead of time or do you just get an idea out of the blue and decide, “Yes, I’ll do that!” ? I’ll say the same! It will depends on the day and of where my inspiration come from! Do you have any other hobbies or passions in addition to designing/scrapping? Thank you Ana for indulging us all with a little bit more about your fantastic self! There are currently two CT calls at GingerScraps! 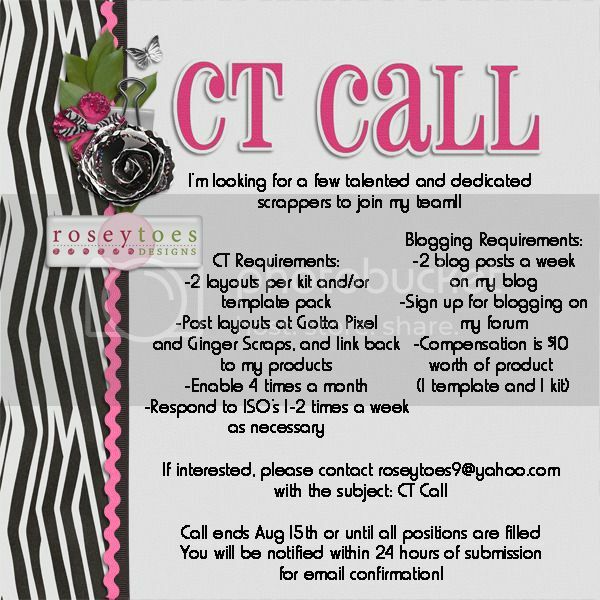 Roseytoes Designs is look for a few talented and dedicated scrappers to join her team! 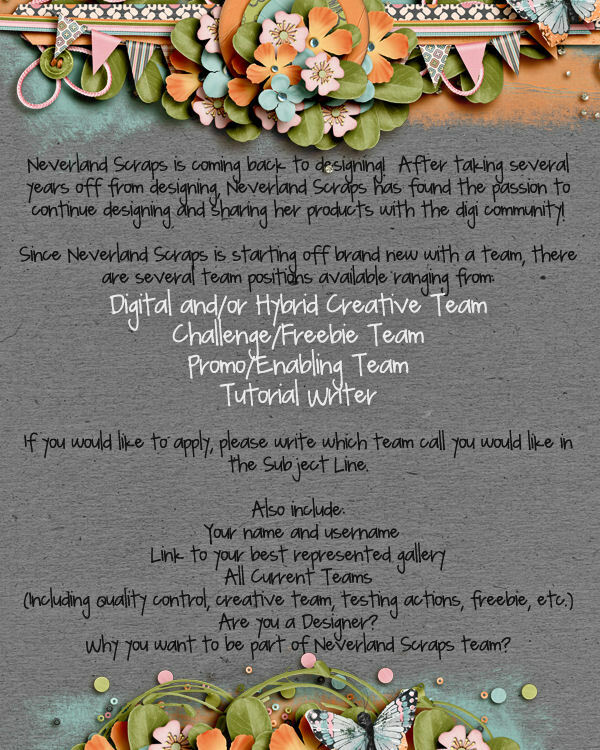 Neverland Scraps is also looking for a some ladies to do a little bit of everything! What else have I got for you? How about a freebie? JenC Designs has added something to our Welcome Wagon! All you’ve got to do is join our forum (if you haven’t already)! Easy peasy! Check out this template she created for us! I suppose that wraps up my wrap up! I hope everyone has a scrap happy Sunday! Weekly Wrap-Up: Sales, CT Calls, Book Club OH MY! I’ve got lots of little tidbits to share with you! First, today is the LAST day to get Pixelily’s shop at 50% OFF! In honor of her grand opening here at GingerScraps her entire shop is on sale! She’s definitely become a fast favorite of mine, and I’ve certainly taken advantage of her Grand Opening Sale! 😉 If there is anything you’ve had your eye on, today is the last day to grab it at half off!! In case you missed last week’s wrap-up, there are two CT calls happening right now, one for Z Pink Boudoir Designs and one for JenC Designs! I’m happy to see that we’ve had a few new members join our forum! It’s always exciting “seeing” new faces, meeting new friends! I love watching our community grow and grow. 🙂 One of the things I love most about the DigiScrapVerse is just how..vast it is! 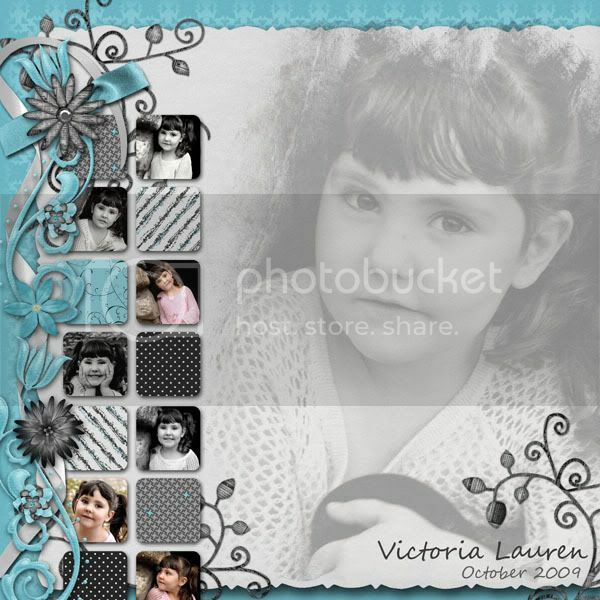 People from ALL over the world come together to share themselves through digital scrapbooking. Truly awesomeness. Let’s see, what other little exciting tidbits do I have to share with you? How about another sale? And with Father’s Day just a week away this is doubly awesome! Connie Prince’s Dear Dad kit is on sale for over 50% OFF right now! I have had my eye on this kit for quite some time, and took this opportunity to snag ALL the coordinating packs to it as well! In addition, there are some great wordart pieces by Kathy Winters Designs available in our store as well! Before I wrap up the wrap-up 😉 I’ve got to stick in just a couple more quick little bits! Have a wonderful rest of your weekend, wherever you are spending it! Weekly Wrap-up: It’s a new month! I do so love it when the new month starts on a Friday- it’s like super bonus with the buffet and new releases and new challenges and and and..! Since our newsletter just delivered you the royal treatment, I want to quick go over some things coming up. The end of the month can be so drab and quiet with all the finishing of challenges and some of us still recovering from iNSD, plus Summer is in full affect most places and I sure hope that means everyone is outside making memories! First up, GingerScraps Book Club! Our read for the month of June is The Lucky One by Nicholas Sparks! I personally have never read a Nicholas Sparks book, but I hear they are fantastic so I can’t wait to start this one as my first! JoyLynn is also looking for some input, she wants to know what you want to see every month in the book club, she’s open to any suggestions! Next, make sure to check out the Bake Sale happening RIGHT NOW! You only have until June 5th to grab as much as your can for just $1 and let me tell you, there are some real surprises in this months bake sale! Do NOT miss this! Did you know there is a brand-spanking-new challenge this month hosted by Jenn of Joyful Heart Designs? It’s a brush challenge! For the first month, she chose a wicked cool bird brush set. Brushes can be used for anything! I know Jenn can’t wait to see what you all come up with, and neither can I! Guess what? Z Pink Boudoir Designs is having a CT call! Join the Zeee-speration! Guess what else?! JenC Designs is having one too! JenC is looking for Guest CTs for the summer months – but there’s a twist! More than one way to enter and more than one way to grab some of her super cute goodies! Good luck to BOTH designers on their calls! 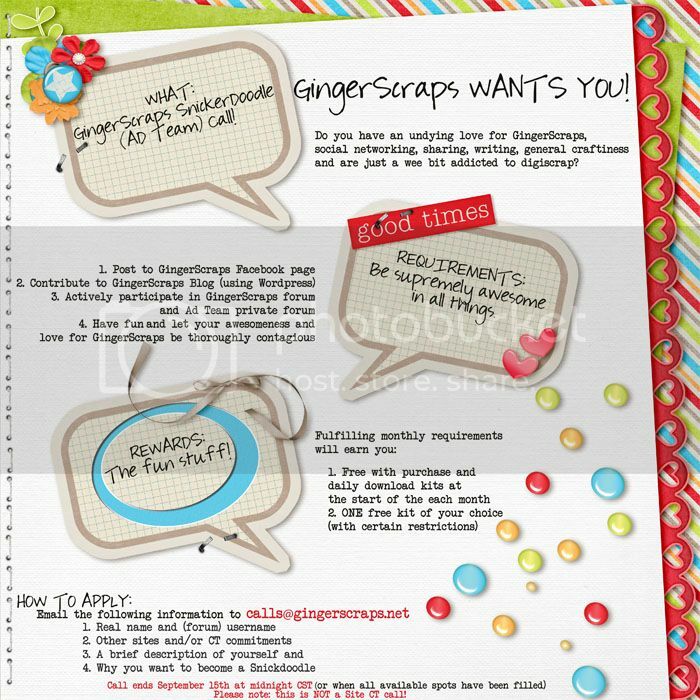 Head over to the GingerScraps Forum HERE and help me give them a warm welcome! And now…. 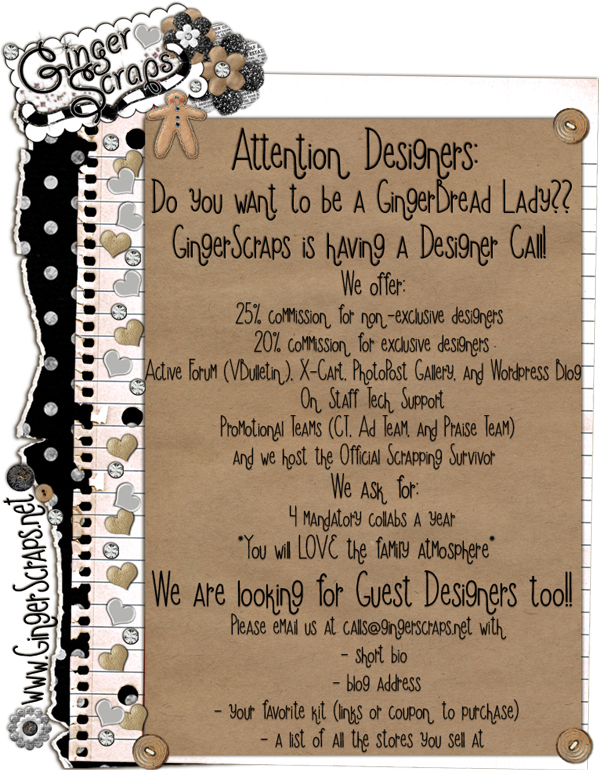 so more exciting news- We are having a Designer Call! Hurry and apply now! We are looking for new and seasoned designers. Exclusive and non-exclusive. And Guest spots open too! Now- on to the Yummy Fresh Goodies!!! Are you looking for something basic with all the necessities? Check out Marshmella Designs newest kit “Josephine”. It’s is a simple kit with a retro elegance that is perfect for every layout. It includes 9 papers, 44 elements and a full set of alphas. 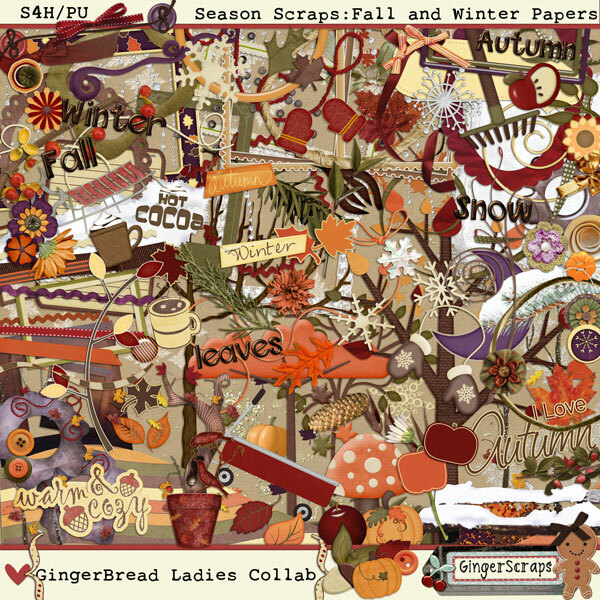 Pretty in Green has a pack of 4 beautiful templates made from her favorite layouts she created during GingerScraps Scrapping Survivor season 2. These Templates use blended photo styling along with great layering and room to journal to create beautiful layouts. These templates are psd files, for size 12×12 inch Layouts. Are you all ready to see this months GingerBread Lady Collab? As always this months kit is only $1.00 with any purchase over $10.00. Remember- please allow 24 hours to receive the coupon as all have to be sent manually. And now- I hope you enjoy a leisurely trip down to the Shabby Seashore. This eclectic kit is perfect for all of your summer memories from those ocean vacations to just a day on the beach with friends and family. The muted colors are perfect for those poolside photos too! Take a walk with us down the Shabby Seashore whenever you need to get away or if your lucky enough to live by the shore, then pull up a chair and enjoy! Bonus Photoshop style set of wonderful wave textures in perfectly matching colors! Here are some by the wonderful GingerBread Girls!